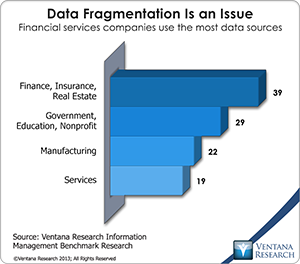 Our research consistently finds that data issues are a root cause of many problems encountered by modern corporations. One of the main causes of bad data is a lack of data stewardship – too often, nobody is responsible for taking care of data. Fixing inaccurate data is tedious, but creating IT environments that build quality into data is far from glamorous, so these sorts of projects are rarely demanded and funded. The magnitude of the problem grows with the company: Big companies have more data and bigger issues with it than midsize ones. But companies of all sizes ignore this at their peril: Data quality, which includes accuracy, timeliness, relevance and consistency, has a profound impact on the quality of work done, especially in analytics where the value of even brilliantly conceived models is degraded when the data that drives that model is inaccurate, inconsistent or not timely. 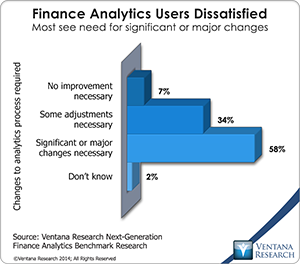 That’s a key finding of our finance analytics benchmark research. The proliferation of chief “something” officer (CxO) titles over the past decades recognizes that there’s value in having a single individual focused on a specific critical problem. A CxO position can be strategic or it can be the ultimate middle management role, with far more responsibilities than authority. Many of those handed such a title find that it’s the latter. This may be because the organization that created the title is unwilling to invest the necessary powers and portfolio of responsibilities to make it strategic – a case of institutional inertia. Or it may be that the individual given the CxO title doesn’t have the skills or temperament to be a “chief” in a strategic sense. Business computing has undergone a quiet revolution over the past two decades. As a result of having added, one-by-one, applications that automate all sorts of business processes, organizations now collect data from a wider and deeper array of sources than ever before. Advances in the tools for analyzing and reporting the data from such systems have made it possible to assess financial performance, process quality, operational status, risk and even governance and compliance in every aspect of a business. 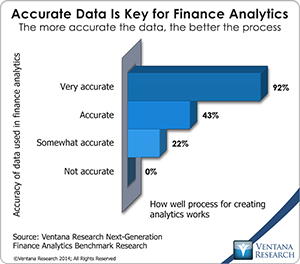 Against this background, however, our recently released benchmark research finds that finance organizations are slow to make use of the broader range of data and apply advanced analytics to it. Anaplan, a provider of cloud-based business planning software for sales, operations, and finance and administration departments, recently implemented its new Winter ’14 Release for customers. This release builds on my colleagues analysis on their innovation in business modeling and planning in 2013. Anaplan’s primary objective is to give companies a workable alternative to spreadsheets for business planning. It is a field in which opportunity exists. 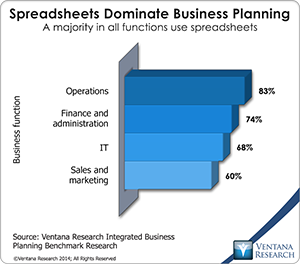 Our benchmark research on this topic finds that a majority of companies continue to use spreadsheets for their planning activities. Almost all (83%) operations departments use spreadsheets for their plans, as do 60 percent of sales and marketing units. Yet the same research shows that satisfaction with spreadsheets as a planning tool is considerably lower than satisfaction with dedicated planning applications. But despite general agreement in companies that the planning process is broken and spreadsheets are a problem, companies seem reluctant to break the bad habit of using spreadsheets. This conclusion suggests that either switching to dedicated software hasn’t been easy enough or that the results of doing it have not been compelling enough to motivate change. Anaplan intends to address both of these issues. 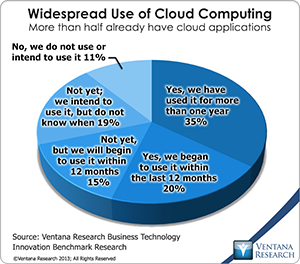 There’s a growing realization that the multitenant approach to the cloud isn’t the only option that companies should weigh in deciding between deploying software on-premises and in the cloud. That some people describe the multitenancy approach as “the real cloud” reflects the contentious nature of some technical debates, especially those that occur early in the evolution of a new technology. Multitenancy does have advantages that confer cost savings, and these have been important in the first stages of cloud adoption. However, we predict that single-tenant structures will rapidly gain in importance as corporations mature in their use of cloud computing, especially with respect to how they manage their ERP systems, as I have written. Corporations are increasingly adopting Web-based applications and moving their computing environments to a hybrid model that combines a combination of on-premises and cloud deployment options (private, community and public; single- and multitenant; or managed cloud). The right choice depends on the needs of the company and the ability of vendors to provide services that match their requirements.